Shortbreads based on wheat flour and delicious pieces of rich dark chocolate. Gourmet handmade shortbread made of wheat flour and delicious pieces of rich dark chocolate. Family company located in Edinburgh, Scotland, and created in 1989 by Anthony & Fiona Laing. Their two sons Rupert & Christopher are now also part of the company. These shortbreads are handmade in Scotland. They are first kneaded by hand to ensure a pleasant texture, a unique taste and a beautiful golden color. They are then cut, also by hand, with cookie cutters and cooked according to traditional practices. The ingredients used are of very good quality. The shortbreads are all made from wheat flour and embellished with light touches of ground rice that provide crunchiness. 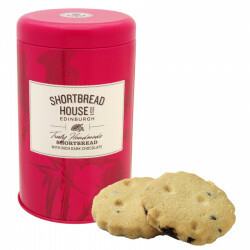 Their numerous awards (73 Great Taste Award medals) prove the quality of these shortbreads. Shortbread House of Edinburgh is very well known in Scotland and is exported to more than 20 countries around the world. Ingredients: flour (wheat flour (Gluten), calcium, iron, niacin, thiamin), butter (milk, salt), sugar, chocolate (8.5%) (cocoa mass, sugar, cocoa butter, fat reduced cocoa powder, emulsifier: Soya Lecithin), ground rice, vegetable oils (rapeseed & segregated sustainable palm oils). Allergy Advice : for allergens, see ingredients in bold. Also may contain nuts, soya and egg. Store in a cool dry place. Handmade in Scotland. To consume preferably before: to see date on the box.